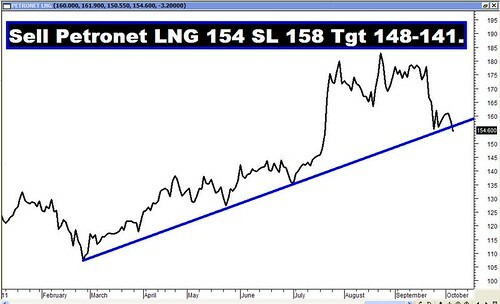 Archives : 4720-4758 - STRONG SUPPORT ZONE - 07/10/2011. 4720 – 4758 – STRONG SUPPORT ZONE – 07/10/2011. NIFTY RANGE : 4720 - 5170. Last week the market was hanging in balance between the two gaps viz. Falling Gap which was acting as Resistance and Rising Gap which was acting as Support. Bearish candle formation (Last Engulfing Top formed two weeks back) suggested that the market is likely to move lower and it did by filling the Rising Gap. This pushed the market back to the support at 4720 and it once again successfully stood the test of the Bears. On the higher side the level of 5170 is the strong Resistance point. Hence the Nifty is expected to stay in the range between 4720 on the lower side and 5170 on the higher side. The Sensex opened the week at 16255, made a high of 16347, a low of 15745 and closed the week at 16232. The Sensex lost 221 points on a weekly basis. Similarly Nifty opened the week at 4874, made a high of 4922, a low of 4728 and closed the week at 4888. The Nifty too closed with a weekly loss of 55 points. Both Sensex and Nifty have formed a Spinning Top formation on the daily charts, after a strong gap-up opening on Friday courtesy of the global markets. On the weekly charts, both Sensex and Nifty have formed small body candles with long lower shadows. For the second week in a row both the indices went lower and tested the support around Sensex 15765 and Nifty 4720 and bounced from those levels. The long lower shadow is a reminder of the support that exists at lower levels. Last week both the indices again bounced back from the so called Support Zone between Sensex 15745-15801 and Nifty 4720-4758. This Support area has been tested three times successfully without getting breached. Similarly both Sensex and Nifty have well defined Resistance points at Sensex 17211 and Nifty 5170. Thus the Nifty movement continues to remain in the range of 4720 on the lower side and 5170 on the higher side. Last week, the indices were trapped between two gaps viz. Bearish Falling Gap and Bullish Upward Gap. Bearish Falling Gap between Sensex 16833-17000 and Nifty 5059-5109 which is acting as a strong resistance area. This week, the indices breached the Bullish Upward Gap between Sensex 16209-16282 and Nifty 4879-4905 which was acting as a support zone, and went below it. Thus any upward movement will find strong resistance around 16833-17000 for the Sensex and 5059-5109 for the Nifty. Both Sensex and Nifty are below the short term moving average of 20dma (Sensex – 16500 and Nifty – 4959) and hence the short term trend is down. The market is well below the medium term average of 50dma (Sensex – 16852 and Nifty – 5065) and long term average of 200dma (Sensex – 18241 and Nifty – 5474). As a result the medium term and the long term trends continue to remain down. The Pull-back was stopped at Sensex 17191 and Nifty 5168 which happens to be just below the previous pull-back level and i.e. at Sensex 17211 and Nifty 5169. Besides these minor tops, there is a convergence of various resistance levels like the Trendline Resistance, and 38.2% of the intermediate fall. Thus we have strong Resistance zone formed at Sensex 17155-17311 and Nifty 5155-5188. Interestingly majority of the Oscillators are projecting bearishness to continue. MACD is once again in Sell mode and in negative territory. It has given three whipsaws in three weeks and hence currently one cannot fully depend on this oscillator. RSI too is finding difficulty in crossing the centerline and is continuously falling from there. Currently it is still in Sell zone at 45. ROC is in negative zone and hence in a Sell mode. Stochastic Oscillator too is in Sell mode as %K is below %D. Interestingly %K is in Oversold Zone, so one should not be surprised if the bounce-back continues. ADX is still at 21 suggesting that the index is not showing much strength. Directional Indicators continue to remain in Sell mode as –DI remains above +DI. OBV continues with its lower top and lower bottom formation and hence continues with its Sell signal. Money Flow has fallen below the centerline and is at 41, thus giving a Sell signal. Nifty OI PCR is strong at 1.49. Friday saw a strong Open Interest addition to the 4800 Put. Thus strong Put writing is seen at 4800 followed by 4700. Highest Call writing is seen at 5200 strike price. Thus Nifty can be expected to find Support around 4800 and will find Resistance around 5200. Trendline Resistance for the Sensex is at 17155. Trendline Support for the Sensex is at 15742. Trendline Resistance for the Nifty is at 5155. Trendline Support for the Nifty will be at 4729. For the week ahead, Sensex will find Support at 15987-15745-15486 and will find Resistance at 16560-16889-17211. For the week ahead, Nifty will find Support at 4806-4728-4637 and will find Resistance at 4984-5077-5169. Once again all the recommendations reached their targets with ease. But the Star performer of the week was GMDC which fell by around 8%!! !